If you need to gain some perspective on life, check out the Scale of the Universe 2, an updated interactive animation first published in 2010. The new version includes information on many of the featured elements. Starting at a common reference point – the size of an average human being – the slider lets you zoom waaaay out to see, for example, the largest galaxies photographed by Hubble and waaaay in to see, for instance, the smallest particles known (or hypothesized) by theoretical physicists. “Scale of the Universe 2″ was created by Cary Huang, a 14-year-old ninth grader from Moraga, Calif., with technical help from his twin brother Michael…”My seventh grade science teacher showed us a size comparison video on cells, and I thought it was fascinating. I decided to make my own interactive version that included a much larger range of sizes,” said Cary in an email forwarded by his mother. “It was not a school project — just for fun. However, my science teacher loved it so much she showed [it] to the class! My brother, Michael, helped me put it on the internet.”…Cary said he worked on the project, on and off, for a year and a half, getting information from Wikipedia and astronomy books. Click the image to start exploring the universe! We all know that countless radio signals are coursing around and through us in our increasingly wireless world. But it’s easy to forget about this invisible layer…unless you have a way to visualize it. One group of artists decided to do just that. 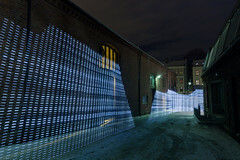 By taking a four meter rod fashioned with 80 lights, they created a “light painting” that reveals the pattern of wifi signals around various urban structures in the Grünerløkka area in Oslo. The bar lights up proportionate to the strength of the wifi signal. The result is a semi-transparent three-dimensional graph of light which is both beautiful and fascinating. See the embedded video after the jump. Read the full story here. Finally we can stare right at the sun! Earlier this week, NASA announced their STEREO project to map the entire sun in 3D. STEREO employs two orbiting satellites – “Ahead” and “Behind” – to map the surface of the sun in real-time. This is intended to provide early warnings in the event of solar flares and other such occurrences that tend to disrupt communications. By combining images from NASA’s Solar Terrestrial Relations Observatory (STEREO) Ahead and Behind spacecraft, together with images from NASA’s Solar Dynamic Observatory (SDO) satellite, a complete map of the solar globe can be formed. Previous to the STEREO mission, astronomers could only see the side of the Sun facing Earth, and had little knowledge of what happened to solar features after they rotated out of view. Following this, space.com posted an amazing image of a solar filament (shown here) that scientists estimate stretches across nearly 700,000 km of the sun’s surface. Statistics can be fashioned to say anything. What motivates you? Dan Pink knows and this video will blow your mind! Autonomy: To have control over my work. Mastery: To get better at my work. Purpose: To be part of something bigger. 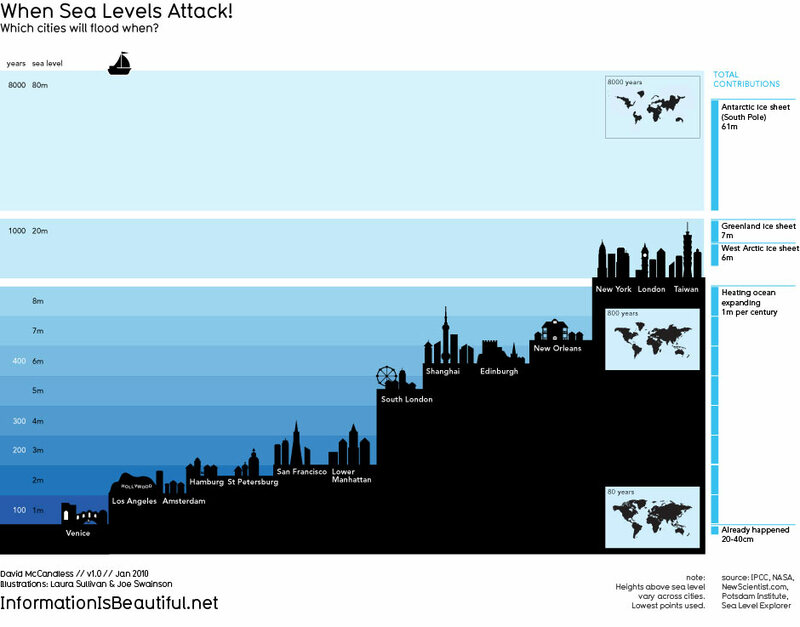 I wanted to share a couple of powerful infographics I came across a while back. These images are not only visually appealing, they convey a large amount of data that would otherwise would be fairly boring (and therefore ineffective). In fact, I won’t add complexity by including unnecessary commentary or explanation. Enjoy! Click the images to view full size. You may need to click on the image again to magnify to 100%.